Avoid single-use plastic bottled water with PureH2O pure water. Have you been taking part in #PlasticFreeJuly? 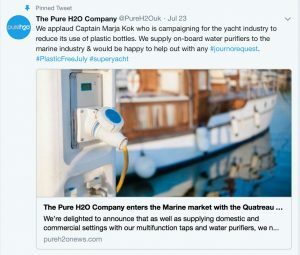 We have and we’ve been sharing lots of plastic-free tips and information on our Twitter feed @PureH2Ouk That’s because our goal at The PureH2O Co. is to help you reduce your environmental impact by saying no to single-use plastic bottled water and choosing pure water instead. We are taking part in Plastic Free July on Twitter, highlighting the problems of single-use plastic bottled water. We know that single-use plastic bottled water is one of the biggest contributors to the pollution of waterways and oceans. Along with other plastics, these water bottles harm marine life and eventually break down into microplastics. Recent research showed that microplastics contaminate 72% of tap water samples. In other words, if you’re drinking tap water, you’re drinking plastics. This is of real concern to human health, as microplastics attract bacteria and absorb toxins, which are released into the body once ingested. Microplastics aren’t the only contaminants found in tap water. Unfortunately tap water also contains pesticides, fertilisers, hormones, medications and bacteria. And we’re all familiar with that unpleasant over-chlorinated taste, too. So we understand why people don’t want to drink tap water. Luckly, that doesn’t mean you have to buy single-use plastic bottled water. 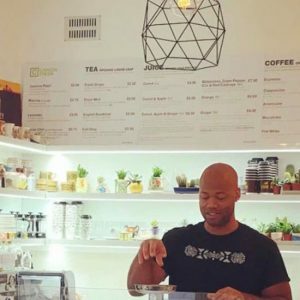 We have the eco-friendly, safe and healthy option. Our water purifiers are the best option for drinking water that is environmentally friendly, healthy and pleasant to drink. Our Purity water purifiers remove up to 99.99% of contaminants and impurities from tap water, including microplastics and plastic fibres, to produce unlimited quantities of pure water. Pure water is just as nature intended and is guaranteed far purer than all bottled waters, not to mention jug filtered and tap water. A Purity water purifier means no single-use plastic bottled water, no food miles and no carbon footprint. We have several water purifier models in our collection for you to choose from. They range from our ultra-compact, Purity 1 reverse osmosis tap water purifier, to our most advanced and incredibly convenient Purity 111 reverse osmosis with de-ionisation model. Any one of our water purifiers immediately reduces your environmental impact because you’ll never have to buy single-use plastic bottled water again. They’re eco-friendly in other ways too, because they contain recyclable components and we designed them to be as water-efficient as possible. So all you need to go plastic-free is a PureH2O Purity water purifier and an eco-friendly reusable water bottle. Tap water refill stations are popping up all over London and beyond. But given the levels of contaminants and impurities found in tap water, you’ll no doubt want a better quality option when you’re out and about. Fortunately, you can find a pure water refill station at Planet Organic stores and at Hello Love in London. There’s also a pure water drinks station at the Eurostar Paris Business Lounge, where you’ll find our Quatreau Smart™Tap dispensing pure water for hot, cold and sparkling drinks. So there’s no need to rely on single-use plastic bottled water when you’re travelling! We know that one of the biggest reasons people still buy single-use plastic bottled water is because they enjoy drinking sparkling water. So we developed an eco-friendly solution for sparkling water, too! Our Quatreau™ collection of smart taps dispenses boiling, chilled and sparkling water. And they’re designed to integrate seamlessly with our water purifiers, too. So when you’re choosing eco-friendly water, there’s no need to go without your favourite sparkling drink. We’d love to help you reduce your environmental impact at home or in your workplace by saying no to single-use plastic bottled water. 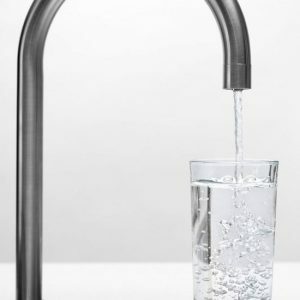 You can view our collection of Purity tap water purifiers here (we have a range of models and prices to suit your needs) and our collection of Quatreau™ sparkling water taps here. You can purchase online, call us on 01483 617000 or email customerservice@pureh2o.co.uk if you have any queries.